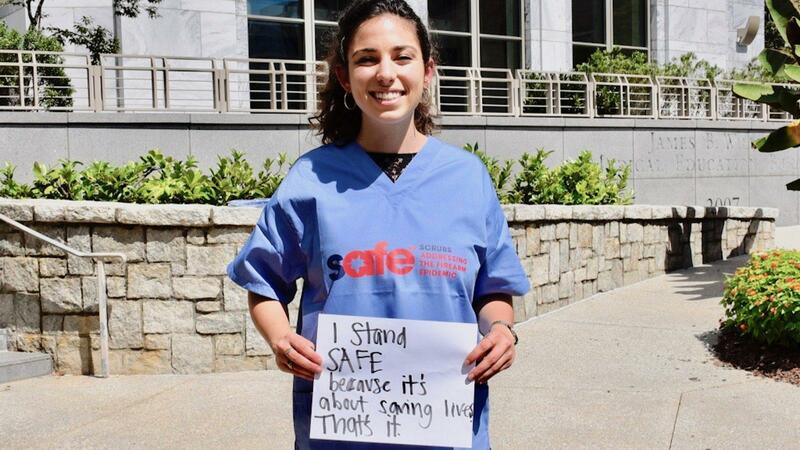 Alyssa Greenhouse, a second year med student at Emory University who is working with SAFE, Scrubs Addressing the Firearm Epidemic to provide training to her peers. Greenhouse is shown holding a sign that says "I stand SAFE because it's about saving lives. That's it." 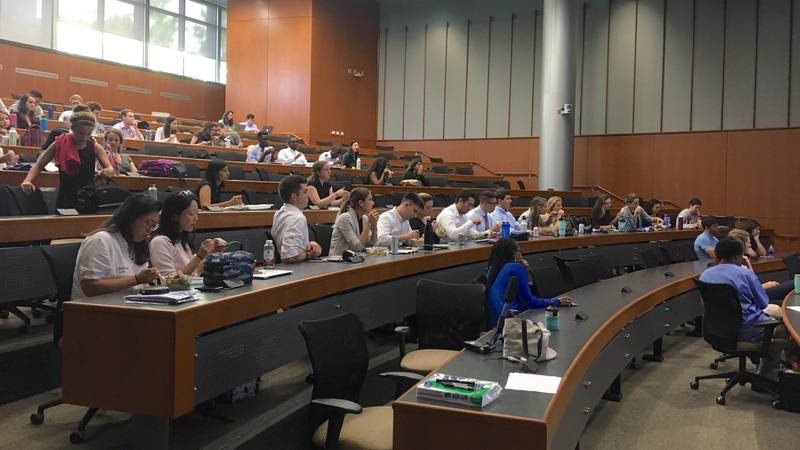 About a hundred students at the Emory School of Medicine gathered during lunch earlier this fall, scarfing down their meal before a panel discussion. They came, on their own time, to learn how to talk to their future patients about gun safety. They only had an hour. “That was the most we’ve talked about it this year,” said Alyssa Greenhouse, a second-year med student at Emory. Greenhouse helped organize the lunch session for her fellow medical students because learning how to discuss firearms with patients is not a part of the mandatory medical school curriculum. “We have had entire problem-based learning sessions on talking about [quitting tobacco]. We have to take a history with every patient, and it asks: ‘Are you safe in the home?’ ‘Do you wear your helmet?’ ‘Do you wear your seatbelt?’ but we just don’t talk about firearms,” said Greenhouse. And she has a theory about why that is. Students at the Emory School of Medicine in Atlanta gather for the session Alyssa Greenhouse helped organize earlier this fall. Across the country, medical students attend presentations like the one at Emory because students like Greenhouse volunteer to organize them. She said news of the 2017 Las Vegas shooting had a major impact on her. The hundred or so students who came to the lunch she organized represent about a fifth of the total undergraduate med students at Emory. Even less if you count residents and Ph.D. candidates. Greenhouse’s goal — besides graduating — is to put on two events like this a year. Since starting her effort she linked up with a nonprofit group called, Scrubs Addressing the Firearms Epidemic, or SAFE. Its mission includes making firearms injury prevention something all medical students learn about as part of their education. Colon cancer kills about 40,000 to 50,000 people each year. So how would it work to get class time on gun safety to be on par with something like colon cancer? “One way is to create a curriculum that is transmitted from one school to the next,” said Gesundheit. He says Stanford is working on a model curriculum now that could be ready in a few years. But getting it to catch on across the country? “That would be quite labor intensive. It would mean lobbying school to school,” he said. It could take a decade or more of work, he estimates. Gesundheit thinks there might be a much faster way. 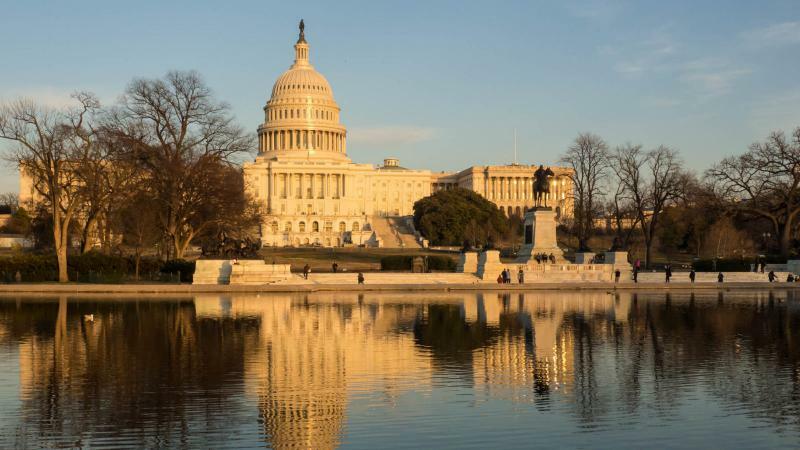 It would require working with medical accrediting bodies within groups like the Association of American Medical Colleges. But it’s not yet clear if that will work. And of course, doctors are just half of the equation. Then there are the patients. Jerry Henry is a gun rights advocate with Georgia Carry. How would he feel if his doctor asked him about guns during an exam? “I would say it’s none of your business,” said Henry. Henry says none of his doctors have ever asked about his plentiful access to firearms. 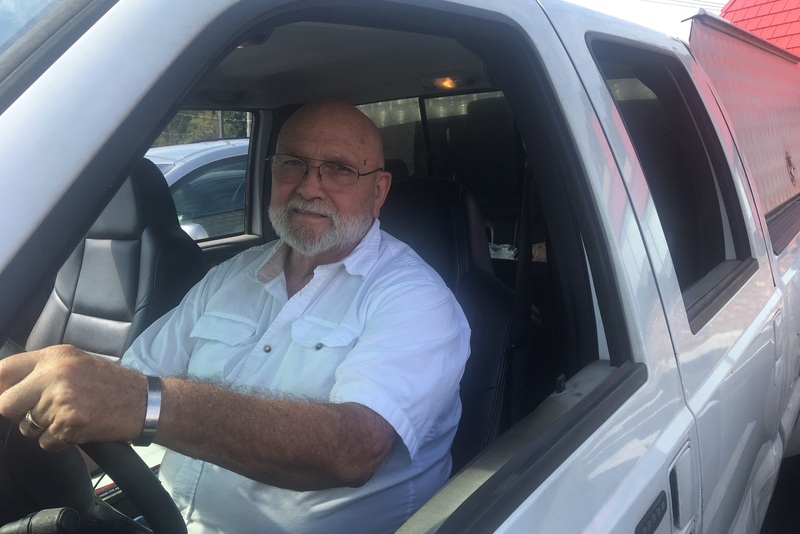 Jerry Henry is gun rights advocate with Georgia Carry and says while none of his doctors have ever asked about his access to firearms, he certainly wouldn’t be open to them doing so. There isn’t a ton of research on how patients react when doctors do ask them about guns. One small study from 2003 found that about 9 percent of patients fall into Henry’s “none of your business” camp. But about 70 percent of survey respondents had no problem discussing guns with their doctors when the study was conducted. Henry believes the growth of gun safety activism since the early 2000s has hardened more gun owners to any hint of questioning about their personal storage habits. In that same window of time, a legal battle in Florida, nicknamed “Docs v. Glocks,” raised many of the same questions of privacy and self-determination. It started with a law that passed in 2011 banning doctors in the state from asking their patients about guns. The law was proposed after a pediatrician told a woman to find a new doctor when she’d refused to answer his question about guns in her home. In 2017, a federal court struck down most of the law — ruling in favor of a group of Florida doctors — but leaving in place a restriction that outlaws discrimination against gun-owning patients. How do patients want to be asked? Fifteen years ago, the question of patients’ comfort with being asked about guns was a small piece of the 2003 study. Now, a researcher in Atlanta is making it her focus. Dr. Lauren Hudak is an emergency medicine professor at the Emory School of Medicine who also treats patients in the emergency department at Atlanta’s Grady Memorial Hospital. She and her colleagues are doing patient surveys now to learn how people feel about doctors or nurses asking them about guns. They’re looking to collect and analyze more than 500 anonymous responses from three hospitals around the city. 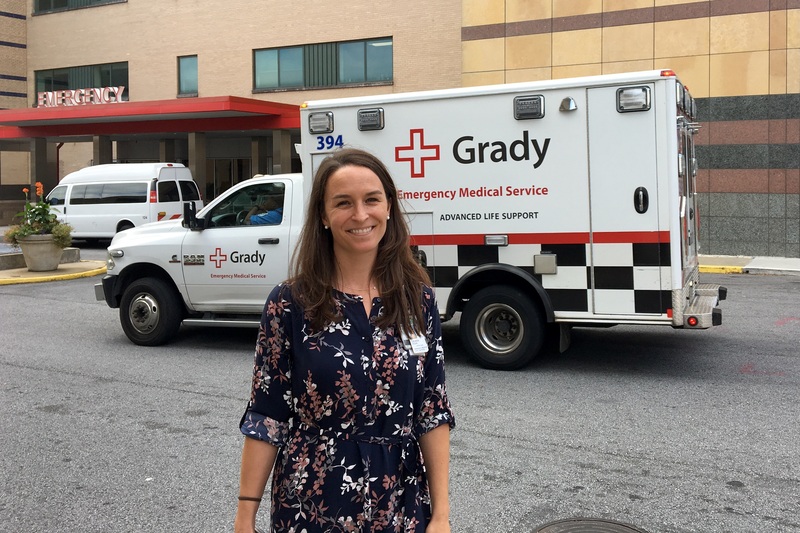 Dr. Lauren Hudak, seen here, treats patients at Atlanta’s Grady Memorial Hospital’s emergency department. She’s also an emergency medicine professor at Emory University in Atlanta. She’s currently researching how patients feel about their doctors asking them about guns in the home. Hudak said learning more about the none-of-your-business crowd is an important part of the project. But she says guns aren’t the only topic that can make patients clam up and feel their agency is threatened. Hudak says pushing patients to answer questions against their will is not the goal. The number of people who refuse to answer will be a valuable data point. One reason for that refusal could include a key concern of Jerry Henry’s, who suspects that data-gathering efforts could lead to a database tracking firearm ownership. Hudak says the way medical social histories are usually collected on something like firearms access — in a free, blank space for miscellaneous note taking — means attempts at aggregation would be exceptionally challenging. Still, she understands the anxiety. “I think that’s a concern with all medical records. And I think that’s why it’s so safely guarded and that HIPAA is king around here. It’s so difficult for health departments to even access our data,” said Hudak. Besides federal privacy laws like HIPAA, the Health Insurance Portability and Accountability Act of 1996 that regulates patient privacy, Hudak said she believes another larger barrier to successfully navigating gun safety conversations in an exam room comes down to credibility. Hudak is looking to have some early results from her research in December. But she is careful to say she is not looking for an approach doctors everywhere can use. She says in the end, the aim is to see if medical professionals can find a way to talk about guns but leave politics out of the exam room. Holocaust survivor Eva Schloss spoke at The Bushnell theater in Hartford, Conn. Monday, just days after the worst anti-Semitic attack in U.S. history. Schloss is the step-sister of Anne Frank, the young girl who wrote a diary about hiding from the Nazis in an attic in Amsterdam during World War II. Eleven are dead and six others injured after a gunman opened fire Saturday inside a Pittsburgh synagogue. What drove this violent act? And how have members of the interfaith community responded in its aftermath? This hour, we find out and we also hear from you. 50 Years Since Landmark Gun Control Act — Where Are We Now?